One of the most debated and controversial aspects of hydraulic fracturing is the risks imposed on water supply. Fracking utilizes large volumes of water, perforates aquifers, injects toxic chemicals into the ground, and then must process millions of gallons of contaminated industrial effluent. This obviously creates large risks to the environment’s water supply, particularly freshwater sources that may be contaminated by the activity. The big question for Florida, as it considers what to do about the intents of the oil industry to fracking Florida, is just how vulnerable Florida’s water resources would be to the activity. Florida’s Aquifer System was formed over millions of years, once covered by the sea, the continuous deposit of shellfish crustaceans created in what is today the Florida Peninsula, formed a thick layer of limestone, which today encapsulates Florida’s water reserves. The last ice age era caused significant sea-level rise, resulting in the flooding of much of the Florida Peninsula, spurred on by drastic climate change trends, making Florida wetter and more humid. In the last 4,000-6,000 years, the Florida Everglades were formed. Florida’s aquifers are approximately 1,000 feet deep. The porous limestone of Florida holds the State’s natural water reserve system. Water is Florida’s most significant and most important natural resource. Ninety three percent of Florida’s population depends on Florida’s ground water for its drinking water. This aquifer is the largest groundwater supply of all of the United State’s 50 States! 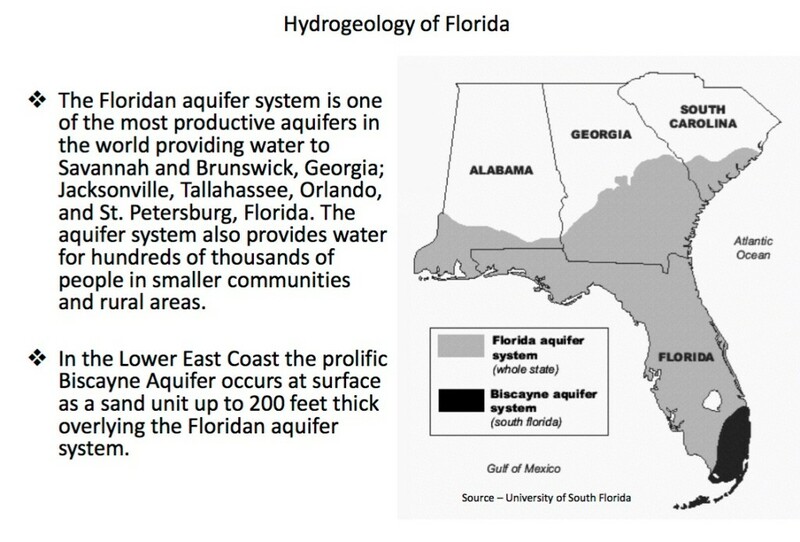 Florida’s water system provides freshwater to localities as far North as Alabama, Georgia and South Carolina, as well as all of the State of Florida. The risks to and the impacts of hydraulic fracturing to water resources drive the most heated dimension of the fracking debate. Fracking requires a very large volume of water to press the oil and gas out of the ground, a notable difference from previous conventional methods used in fossil fuel extraction, which also required water (for drilling) but not in such great volumes. In conventional oil and gas operations, a well is drilled until reaching an oil reserve and then the fossil fuel is suctioned out. Except for its use as a lubricant for drilling, water is not a central input to the conventional oil and gas extraction process. In fracking, however, large volumes of water are pumped into the ground along with added chemicals commonly referred to as “fracking fluids,” and then the mixture, containing oil and/or gas, is pumped back out along with the water and chemicals. The amount of fracking fluids recovered per operation varies greatly, anywhere between ten and ninety percent (which is a very large spread), with the rest remaining in the ground. This need for water immediately brings up the issue of where to get the water, and what to do with it once it’s contaminated. There are two types of industrially contaminated water generated from fracking operations: flowback water (extracted the first 30 days or so from the time the well is put under pressure) and then what the industry ironically refers to as “produced water”, which flows out of the well over the entire life of the well (which may be for many years). Of course, oil and gas companies that carry out hydraulic fracturing do not produce water, but rather, they contaminate water and produce instead an industrial effluent. This effluent is a very toxic industrial effluent containing a variety of toxic chemicals, fuels, sand and water. Production water is deemed to be “dirtier” than flowback water as it manifests higher Total Dissolved Solids (TDS) and Total Suspended Solids (TSS), that is, it has higher amounts of toxic debris in the water in solid or liquid form. This effluent must be removed onto the surface in order to separate the marketable fossil fuels from the contaminated liquid and other remains. This flowback waste liquid contains large amounts of brine (salts), toxic metals, organic hydrocarbons, and naturally occurring radioactive materials (NORM). The big question and challenge for oil and gas companies is to figure out what to do with all of the left over contaminated water once the fossil fuels are extracted and sent to market. The easy way out for the industry has been simply to pump the effluent back into the ground into deep wells and leave it there, forever. Evidently, this is not a very environmentally friendly solution. To complicate matters further, recent studies are showing that pumping massive amounts of industrial effluent into deep wells can, and has caused earthquakes.Other approaches to ground injection have varied considerably. In some cases water is separated from toxic elements and recycled, on the one hand recuperating a portion of the water, but on the other, leaving a heavier and more concentrated industrial effluent to treat. Recycling may be used for reducing concentrations of the effluent to meet subsequent disposal standards, to reuse parts of the effluent for industrial use (including fracking again) or to extract and process effluent to an acceptable level of contamination to be sent into an industrial channel, sewer or other facility for later treatment. Other times, industrial effluents are treated at already existing municipal facilities (which usually do not have the capacity to treat fracking effluents which are generally more contaminated than the effluents they usually receive), or are handled by specialized brine-treatment facilities, or portions of liquids may be dumped into local waterways, placed into stationary impoundments, ponds or pits, or left in permanent storage tanks, indefinitely. Many millions of gallons of industrial effluent must be treated and disposed of per well. That amounts to quite a large volume of contaminated water generated by fracking operations. According to official estimates, in the Unites States alone, 2.4 billion gallons (9.1 billion liters) of wastewater are generated per day from active oil and gas well operations. Fracking contaminates water throughout each stage of operations, but is most intensely utilized during early stages of preparing wells. About 2.8 million gallons of water (about 11 million liters) are used per well, and considering that a single fracking platform might have up to 11 or 12 wells, some 30 million gallons of water (120 million liters) are necessary for some fracking sites, a volume that is in direct competition with other uses for this water (personal, community, agricultural, industrial, etc.). Treating industrial effluents from fracking is not easy (nor is it cheap), and in many cases, the facilities that receiving the effluent are not prepared to treat them. A recent study by Warner et.al analyzing downstream water quality from a bromide facility (a facility that treats fracking effluents) found worrying levels of radioactive radium concentrations at 200 times normal levels in stream sediment. Chloride and bromide concentrations were on average 4.5 to 12 times normal levels. The treatment plant was found to contribute about 90% of downstream chloride content. Heavier metals extracted from fracking effluents must be treated with great care, including the sludge left over once all of the recyclable water is extracted. Generally, contamination levels of this sludge are too high to send the sludge to municipal waste dumpsites and hence it must be treated as hazardous waste, adding another complication (and cost) to handling fracking effluents. Evidently, water management is a key concern in fracking operations. Whether the issue is availability of water, cost of disposal, cost of treatment, cost of recycling or obtaining new water supplies, access to water determines much of the economic bottom line of hydraulic fracturing operations. At the same time, the resource also determines the level of contamination that the activity will generate. Another concern related to water safety compromised by fracking activity is potential risks to aquifers. In most cases, shale gas and oil reserves are beneath water aquifers. This means that to get to the fossil fuel reserve, companies must drill through the aquifer, install steal tubes (casings) that will remain in the aquifer through the life of the project and beyond, essentially forever. Then hydraulic pressure opens up fissures in the geology beneath the aquifer, releasing contaminated liquids into the geology. The oil, gas, fracking liquids, soiled water etc., are then suctioned through the steel piping up through the geology and through the aquifer on to the surface. Risks and impacts to the aquifer can derive from two sources: 1. Faulty piping and cementing of piping that allows contaminated fluids to seep directly into the aquifer and 2. Fissures that might extend dangerously close to the aquifer, potentially contaminating it directly. 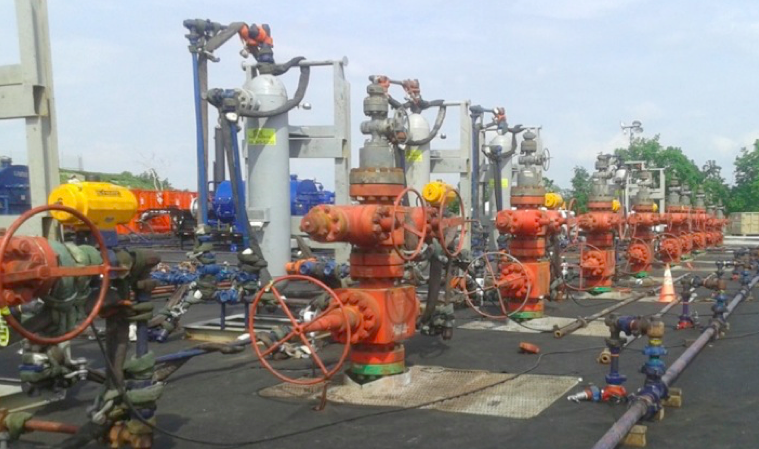 Image: A single well pad may have up to 11 or 12 different wells drills; in this picture the red Christmas tree-like valves close off each well drilled. Ten are visible in the image. 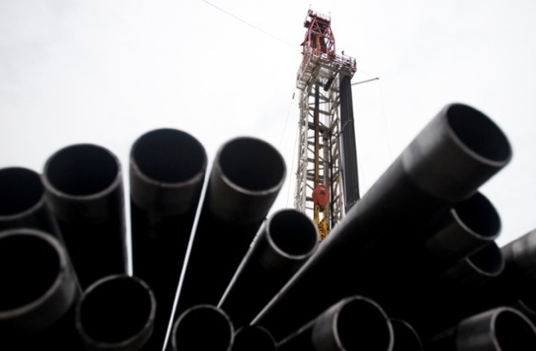 Photo: JDTaillant, at a Pennsylvania-Marcellus Shale gas well. Image: Depiction of a fracking well dug close to a water aquifer shows risks of fissures close to the water resource. The 2008 documentary Gasland, showing tap water igniting, presumably because oil or gas well casings had ruptured and permitted fossil fuels to seep into the local aquifers, spawned a heated debate about the risks of fracking wells close to community aquifers. The industry argues that technology has improved since early wells were drilled and that proper cementing of casings avoids any risk to water resources. Evidence of contamination and multiple legal cases brought by homeowners, however, are not on the side of the industry. “impacts to drinking water resources from subsurface liquid and gas may occur if casing or cement are inadequately designed or constructed, or fail. [and that] There are several examples of these occurrences in hydraulically fractured wells that have or may have resulted in impacts to drinking water resources.” (EPA. June 2015, P. ES14). Image: Fracking well pipes stacked at fracking site ready for assembly and submersion into the ground. A single completed fracking pipe can be more than five miles long (eight kilometers). 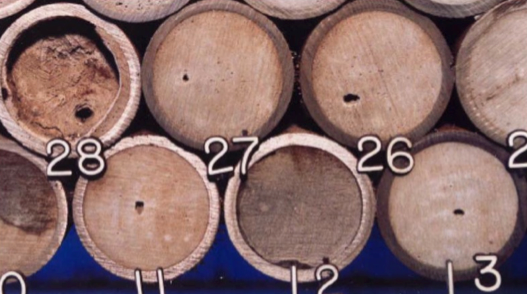 A five-mile pipe (which is neither short nor long for the industry) would have up to 800 union junctures, each a potential spot for corrosion, breakages or leaks. Additionally, it has been shown that there is a much higher fail rate at unconventional well drillings compared to conventional ones, which exacerbates the risks of the leakage. 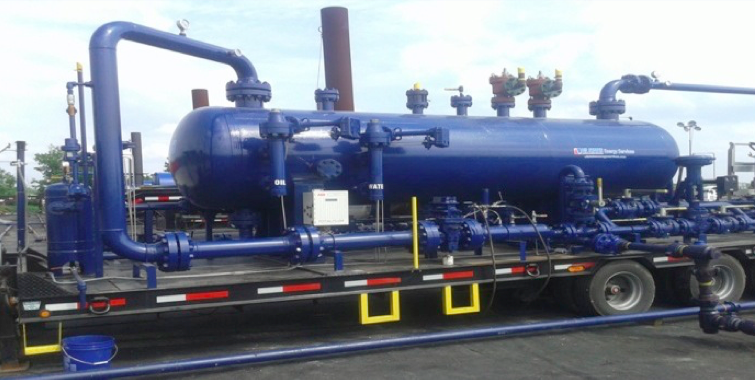 If there are flaws in the design or construction of well casings, or if over time the steel used in the casing and the pipe unions rust or break due to corrosion, or due to an earthquake, for example, they can release oil and gas as well as other hazardous chemicals (fracking fluids) into the ground, into aquifers and into the atmosphere. There is a high tendency for this particular type of well to fail; an average of 6.2% of fracking wells in Pennsylvania, for example, were found to be leaking in an independent study. The fail rate may be higher in countries with less environmental oversight or where best practices are not employed in casing design. 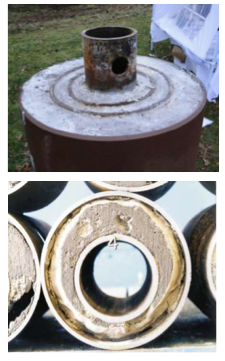 Image (above – lower): In reality, the concentricity of pipe cemented casing, particularly once the wellbore begins to migrate horizontally—sending the internal casings to the bottom due to gravity, is more likely to by like in this image, where there is more manifest eccentricity, than concentricity. That is, the internal piping pushes downward, leaving a dangerously thin layer of cement separating the pipes. In this image we also see the contamination of cement by drilling mud, causing weaknesses in the cement integrity which can also lead to contamination. Source: Desseault et.al. In addition to eccentricity in cement casing are the potential to generate pores in the cementing process through which toxic gases or chemicals can seep to the groundwater, due to the pressurization irregularities in the cementing process. In the next image (provided by Dusseault et.al., 2014 quoting a study by Watson 2004), we see channels and gas pockets as a result of gas invasion during cementing set. Image: Channels and gas pockets caused by faulty cementing are a possible channel for contamination. Source: Watson 2004, quoted in Dusseault 2014. It should also be noted that over time, the integrity of wells may fail. We cannot be certain that over many years, decades or even centuries, there might not be a compromise to the integrity of an abandoned well, causing seepage to migrate into sensitive environmental resources. Another point of concern placing water resources at risk are the large open contaminated water deposits which are kept and/or treated at the surface. These ponds represent a serious risk to flora and fauna, as well as to human health, should their content mix with fresh water resources. Risks and impacts from ponds of industrial effluent can come from breakages to the plastic lining resulting in seepages into the ground and potentially into the ground water, problems with the structure of the pond which may result in undesirable flows of effluent into nearby soil or local streams, unanticipated flooding in the area which may cause effluents to mix with drainage water and enter local streams, storm drainages, sewers or directly into the community, contamination from gusts of wind which pick up contaminants from the surface of the pond circulating them into the local air, contamination of fauna which may drink water from the industrial effluent pond. In sum, if the EPA is correct, and if these wells are representative of the sector, about 10% of wells will at some point spill part of their industrial effluent. We should also recall that these contaminated sites, unless fully cleaned, remain contaminated indefinitely (forever) or until someone cleans them up. The EPA also notes that “chemical properties [chemicals in hydraulic fracturing] that affect the likelihood of an organic chemical in produced water reaching and impacting drinking water resources include: mobility, solubility, and volatility.” (EPA, June 2015, P. E18) That is, the chemical properties present in this effluent water may be such that the toxicity of the deposit may not be statically located but rather move undesirably to contaminate other unprotected and uncontaminated locations. Finally we should note that hydraulic fracturing is a relatively new technique and as such we do not have long-term information about the integrity of well casings or abandoned fracking wells over time to know and understand how these sites will survive over the years. The fact that a gas or oil company cannot trace a methane leak from its piping or an effluent leak in the vicinity to its installations, doesn’t mean that the leak isn’t coming from their fracking operations and the extensive web of drilling they’ve conducted under the ground. It can also be due to an unforeseen invasion of one company’s well, into another company’s previously drilled (and possibly abandoned) well. Because a single well pad that might have 10 or 12 different wells drilled in all directions, the expansive extent of drilling may reach a very large geographic area extending out in a circular fashion, several miles from the well pad site. The potential or capacity of a company or a State authority to identify all of the potential leakage points in this vast area is low, yet the risk that such leakage occurs is extremely high.